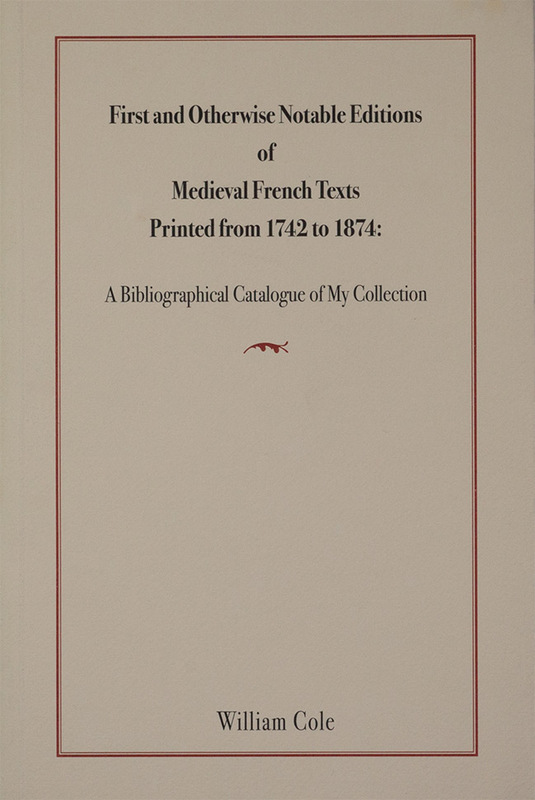 The first bibliography of first and other early editions of Old French texts. “Old French” refers to the language written (and presumably spoken) in northern France (and Anglo-Norman England) until the beginning of the 14th century. It was a thriving literary language, producing great epics (the chansons de geste), romances (including those of Chrétien de Troyes), lyric, fabliaux, fables, hagiography, verse and prose chronicles, drama, etc. By the time printing arrived in France in the mid-15th century, Old French had long disappeared, having been replaced by Middle French. Logically enough, early French printers focused on the current language, and the Old French texts slept in their manuscripts, apparently consigned to the dustbin of history. During the Enlightenment, however, a few French intellectuals began to appreciate the importance of Old French literature. In 1742, Levesque de la Ravallière published the works of Thibaut de Navarre. This was the first printed edition of any Old French text. A smattering of texts appeared during the second half of the 18th century and the first few years of the 19th century, but it was not until about 1820 that the first real flowering began. Between 1819 and 1874 virtually all of the important Old French texts appeared in print for the first time: epics like the Chanson de Roland, Aliscans, and Raoul de Cambrai; romances by Chrétien de Troyes, Gautier d’Arras, and Raoul de Houdenc; short verse works by Marie de France, perhaps the greatest woman writer of all time; historical fiction by Wace; all of the important early texts relating to Tristan and Isolde; and hundreds of others. This intellectual movement was incredibly important for many reasons. For one thing, the Western world suddenly rediscovered the fascinating culture of medieval France. Many of the texts are great literature, and many others shed a fascinating light on medieval manners and daily life. For another, the principles of philology - which up until that point had been the exclusive province of Hellenists and Latinists—had to be adapted for the first time to modern languages. The textual editors involved—including Francisque Michel, Paulin Paris and his son Gaston, Achille Jubinal, Immanuel Bekker, A.J.W. Jonckbloet, Le Roux de Lincy, Thomas Wright, and many others, are still remembered. Finally, out of respect for these texts (and because of the small market for them), the editions were usually very small (sometimes as few as 30 copies) and luxurious, and many of the the finest printers and publishers in France, England, Germany and other countries - including Didot, Bulmer, Crapelet, Pinard, Whittingham, and Jouaust - experimented with hierarchical editions, exceptional typography, and exotic papers: in its totality, this proved to be an important precursor of the fine press movement that was to arise later in England. Yet despite the undeniable importance of these editions, no bibliography of them has ever appeared - until now.